Just like us humans, dogs can develop itchy, uncomfortable skin for a number of reasons—some of which may require a trip to the vet, while others can be treated with simple, at-home remedies. 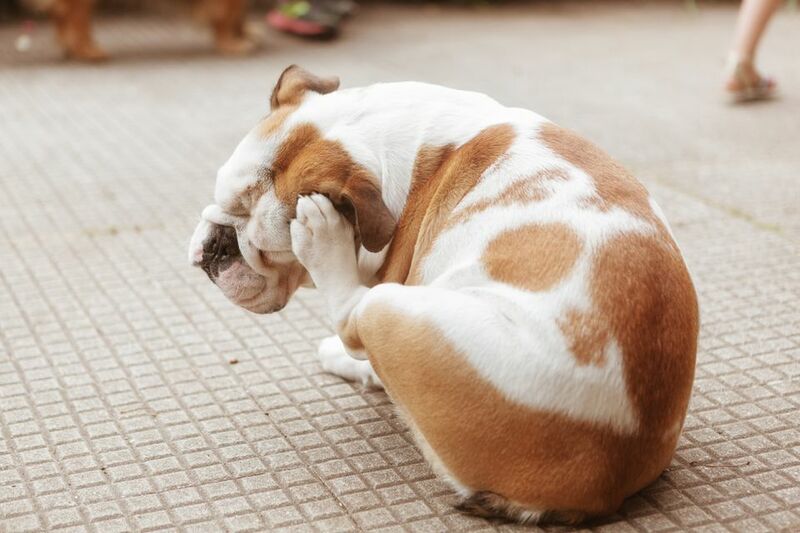 Some common causes of itchiness in dogs include environmental or food allergies, which usually cause discomfort around a dog's paws, ears, groin, and rump; bug, flea, or tick bites, which are generally localized around the rear end; and autoimmune disorders that can cause body-wide itchiness. When Should You Call the Vet? The good news is that occasional or mild itching usually isn't a sign of serious health conditions, but if your dog starts to develop other symptoms, like loss of appetite, restlessness, or depressed mood, or her itchiness is so severe that she breaks her skin when she scratches, talk to your vet ASAP. It's important to treat the underlying cause of her severe, chronic itchiness to avoid developing more open wounds and infections in the skin. Depending on the cause, your vet may recommend prescription or over-the-counter medications, or medicated bathing products. As always, consult your vet before starting any skincare regimen for your dog, and stop the treatment if your dog's symptoms remain the same or worsen. This age-old remedy isn't just an old wives' tale—a collodial oatmeal bath can seriously soothe your dog's itchy skin by reducing inflammation and washing away allergens that get trapped in the fur. Whether you buy pre-made collodial oatmeal (it's produced by grinding the oat into a fine powder and boiling it to draw out the collodial) or grind plain, sugar-free oatmeal into a powder yourself, collodial oatmeal's anti-inflammatory properties can ease redness, swelling, and itchiness, and cool your dog's hot, uncomfortable skin. What's more, oatmeal is totally non-toxic, so you don't have to worry if your dog gets a lick. Sure, apple cider vinegar is a tasty ingredient in homemade salad dressings, but did you know it can be used as a powerful antibacterial and anti-fungal treatment, too? Simply combine a mixture of 50 percent apple cider vinegar and 50 percent water in a clean spray bottle, then spray your dog's itchy spots with the solution. If your dog's paws are irritated, you can use the mixture for a nice, relaxing paw soak for up to five minutes. It's important to note that apple cider vinegar should never be used on raw skin or open wounds—it can be extremely painful for your dog and worsen symptoms. Although there's been some controversy around coconut oil and heart health, chilled, solidified coconut oil can soothe the discomfort associated with doggy eczema, allergies, skin yeast infections, and even bug bites when massaged into the coat and skin. When you're shopping for coconut oil, try to find the highest quality, human-branded coconut oil you can find—look for terms like "organic," "unrefined," or "virgin" on the label. And if you want your coconut oil to do double duty, you can also try mixing a small scoop into your dog's kibble, but you should always consult your vet before changing up her diet. Chamomile and green teas are well-known for their soothing, anti-inflammatory effects in humans—but they work just as well for dogs, too. If your dog is dealing with hot, itchy patches of skin, try giving her a soothing soak in a chamomile or green tea bath. Here's how to do it: Fill your bathtub or sink with lukewarm water and let several tea bags steep for three to five minutes. Then, remove the tea bags and let your dog soak in the mixture for at least five minutes. If you want to spot treat your dog's skin, steep a tea bag and let it cool completely before applying the tea directly to affected areas. If you've ever had a sunburn, you know all-natural aloe vera can be a lifesaver. Not only is aloe vera a powerful healing agent, but it can also reduce redness and draw uncomfortable heat away from the skin. You can apply aloe vera directly to your dog's affected spots, but be sure to choose a gel that doesn't contain alcohol—otherwise, you risk burning your dog's skin and worsening his symptoms. Most grocery and drugstores sell 100 percent natural aloe vera, or you can harvest it from an aloe vera plant if you have one at home. A pantry staple, baking soda can do much, much more than make your baked goods rise. When combined with water and blended into a thick paste, baking soda can dry out rashes on the skin, alleviate itching, and reduce redness and inflammation. All you have to do is combine 50 percent baking soda with 50 percent water and apply the paste to your dog's skin. After about 20 minutes, rinse completely. For a more moisturizing blend, add a little bit of high-quality coconut oil to the mixture. And if your dog is experiencing body-wide itchiness, you can also add some baking soda to her bath. Feeding your dog a balanced diet with plenty of omega-3 fatty acids and healthy carbohydrates can help soothe and heal his skin from the inside, out. How? Many dogs are allergic to the ingredients found in standard chicken, beef, or turkey-based dog foods, as well as wheat or gluten ingredients. Swapping in fish-based foods or foods containing sweet potatoes can alleviate the symptoms associated with doggy food allergies. Plus, fatty fish are rich in omega-3 fatty acids, which are proven to reduce inflammation, improve digestion, and promote skin health. Just remember: You should always consult your vet before changing your dog's diet or adding any new supplements.